Part Used & Method for Pharmaceutical Preparations: The bark is cut in the period of Great Heat (twelfth solar term) and peeled off in the period of the Beginning of Autumn (thirteenth solar term). It is dried in the shade and cut into slices. Meridians: Kidney, spleen, heart and liver. 1. Kidney yang deficiency manifested as cold limbs, soreness and weakness of the lumbar region and knees, impotence, spermatorrhea and frequent urination. Cinnamon bark (Rougui) is used with Prepared aconite root (Fuzi), Prepared rehmannia root (Shudihuang) and Dogwood fruit (Shanzhuyu) in the formula Gui Fu Bawei Wan. 2. Deficient yang of the spleen and kidneys manifested as cold pain in the epigastric and abdominal regions, poor appetite and loose stool. Cinnamon bark (Rougui) is used with Dried ginger (Ganjiang), White atractylodes (Baizhu) and Prepared aconite root (Fuzi) in the formula Gui Fu Lizhong Wan. 3. Cold stagnation in the meridians manifested as epigastric and abdominal cold pain, lower back pain, general pain, irregular menstruation and dysmenorrhea. 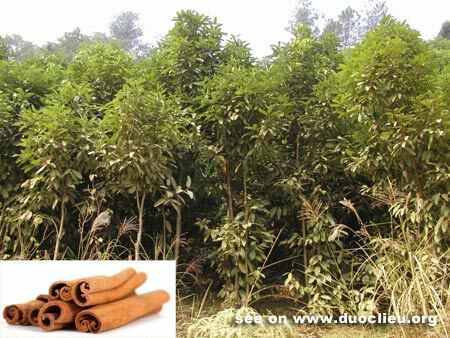 Cinnamon bark (Rougui) is used with Dried ginger (Ganjiang), Evodia fruit (Wuzhuyu), Chinese angelica root (Danggui) and Chuanxiong rhizome (Chuanxiong). 4. Yin type of boils (chronic boils). Cinnamon bark (Rougui) is used with Astragalus root (Huangqi) and Chinese angelica root (Danggui) in the formula Tuoli Huangqi Tang.